Advanced Bionics announces the availability of the Naída CI Q90 Acoustic Earhook for Naída CI Q90 recipients in the US and Canada. With the simple addition of the acoustic earhook, the Naída CI Q90 sound processor can deliver acoustic amplification in combination with electrical stimulation to help maximize your hearing experience. Intended for CI candidates and recipients who may benefit from acoustic amplification, the Naída CI Q90 Acoustic Earhook is an all-in-one solution that extends AB’s portfolio for individuals with severe-to-profound hearing loss. The Naida CI Q90 Pre-sale starts on November 16th for US and Canada residents! The newest processor from Advanced Bionics offers these exciting features: Contact Customer Service to place your order today. With AutoSound™ OS technology, your Naída CI Q90 intelligently analyzes and automatically adapts to the sound around you, so you hear your best wherever you go without having to change programs or adjust any settings. The StereoZoom feature uses the front and back microphones on both processors to zoom in on a single voice in a noisy environment, so you can chat one-on-one with less effort in extreme noise. The WindBlock feature automatically reduces wind noise for greater comfort in windy environments like a golf course or the beach. The SoundRelax feature automatically dampens unexpected loud sounds, such as door slamming or clanging dishes, for a more pleasant listening experience. The EchoBlock feature improves the sound quality in reverberant environments you encounter, like museums, galleries, and places of worship. Some of these features will be available for the Naída CI Q70. An appointment with your audiologist will be necessary to activate them. Initial Naída CI Q90 upgrades will be reserved for recipients who are paying for the upgrade, including a trade-in program for current Naída CI Q70 recipients. Information for Naída CI Q70 recipients who were implanted on or after February 9th, 2015 will be provided shortly. In addition, two smaller, lighter batteries with improved battery life will also be available. The PowerCel 110 Mini and PowerCell 170 Mini offer extra comfort and up to 36 hours of battery life. These exciting new batteries will also work with the Naída CI Q70. Stäfa (Switzerland), 18 August 2015 – Sonova Holding AG, the world’s leading provider of hearing solutions, announces today that its subsidiary Advanced Bionics (AB) has received FDA (Food and Drug Administration) approval in the United States for its new Naída CI Q90 and Q30 sound processors. FDA approval follows Health Canada approval earlier this year. 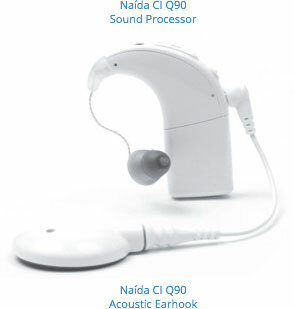 Distribution of the Naída CI Q90 sound processor is expected later this year in the United States and Canada. The Naída CI Q30 is designed to meet the needs of the global market and will be available in specific markets outside of North America. The new Q90 is the top-of-the-line processor in the Naída CI Q Series from Advanced Bionics, following the previous release of the Q70. Offering new PowerCel innovations that reduce size and improve battery life as well as new microphone technology for focusing on speech, the Naída CI Q90 now raises the bar as the premium choice for recipients who want the full line of features in the most compact package. Some of the advanced Q Series features include industry leading automation with new innovations that block obtrusive sounds, such as wind and echoes, to improve hearing in challenging settings. Supporting the Naída CI Q Series, the latest version of AB’s signature fitting software, SoundWave 2.3, also received FDA approval. The Naída CI Q90 is the top-of-the-line processor in the Naída CI Q Series from Advanced Bionics, following the previous release of the Naída CI Q70, which raised the bar for superior hearing. Offering new microphone technology for focusing on speech, the Naída CI Q90 now surpasses the bar as the premium choice for recipients who want the full line of features. New and current Naída CI Q70 recipients** can also benefit from some of the advanced new Q Series features, including new innovations that automatically reduce obtrusive sounds, such as wind, echoes, and sudden loud noises to improve hearing in difficult environments. The Naída CI Q30 sets the bar for the Q Series family, offering proven AB and Phonak technology that lead the industry for hearing in noise and the option of the smallest PowerCel battery to date, compatible with all Q Series processors. Available for the Naída CI Q70 and Q90 sound processors, Phonak Binaural VoiceStream Technology™ gives two Naída CI processors the unique ability to work together for improved hearing in challenging situations. Sound from one side is transmitted to the other side so that recipients hear the sound in both ears at the same time while distracting noise is reduced. No other manufacturer can offer the extraordinary binaural benefits this technology provides for effortless communication. The only sound processor family that delivers hearing as unique as you are, the Q Series provides state-of-the-art technology designed to help recipients communicate with confidence, enjoy music, and stay connected to the latest consumer electronics. The latest version of SoundWave, AB’s signature fitting software, will soon be available to clinicians for enabling the new features. VALENCIA, Calif., May 28, 2015 – Advanced Bionics (AB), a global leader in cochlear implant technology and a company of the Sonova Group, announced today that the new Naída CI Q90 EAS received TÜV approval for distribution in Europe. With the arrival of this new product, now more than ever, cochlear implant recipients have access to the combined technologies of AB and Phonak, the innovation leaders in cochlear implants and hearing instruments.